When working with a PivotTable, you can display or hide subtotals for individual column and row fields, display or hide column and row grand totals for the entire report, and calculate the subtotals and grand totals with or without filtered items. In a PivotTable, select an item of a row or column field. Make sure it is a field and not a value. On the Analyze tab, in the Active Field group, click Field Settings. This displays the Field Settings dialog box. To subtotal an outer row or column label using the default summary function, click Automatic. To remove subtotals, click None. Note: If a field contains a calculated item, you can't change the subtotal summary function. To use a different function, to display more than one type of subtotal, or to subtotal an inner row or column label, click Custom (if this option is available), and then select a function. The sum of the values. This is the default function for numeric data. The number of data values. The Count summary function works the same as the COUNTA function. Count is the default function for data other than numbers. The product of the values. The number of data values that are numbers. The Count Numbers summary function works the same as the worksheet COUNT function. The standard deviation of a population, where the population is all of the data to be summarized. The variance of a population, where the population is all of the data to be summarized. Note: You cannot use a custom function that uses an Online Analytical Processing (OLAP) data source. 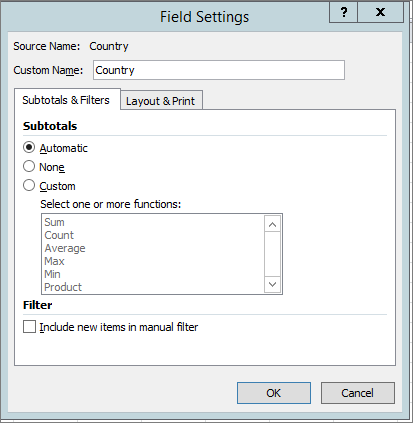 To include or exclude new items when applying a filter in which you have selected specific items in the Filter menu, select or clear the Include new items in manual filter check box. To quickly display or hide the current subtotal, right-click the item of the field, and then select or clear the check box next to Subtotal "<Label name>". On the Design tab, in the Layout group, click Subtotals. Select Do Not Show Subtotals. Select Show all Subtotals at Bottom of Group. Select Show all Subtotals at Top of Group. On the Design tab, in the Layout group, click Grand Totals, and then select the grand total display option that you want. To display grand totals, select either Show grand totals for columns or Show grand totals for rows, or both. To hide grand totals, clear either Show grand totals for columns or Show grand totals for rows, or both. Select or clear the Subtotal filtered page items check box to include or exclude report filter items. Note: The OLAP data source must support the MDX expression subselect syntax. Select or clear the Mark totals with * check box to display or hide an asterisk next to totals. The asterisk indicates that the visible values that are displayed and that are used when Excel calculates the total are not the only values that are used in the calculation. Note: This option is only available if the OLAP data source does not support the MDX expression subselect syntax. For non-OLAP source data, select or clear the Allow multiple filters per field check box to include or exclude filtered items in totals. On the Options tab, in the Active Field group, click Field Settings. In Excel Online, you can view PivotTable subtotals and totals if your workbook has PivotTables that show them. However, you won't be able to subtotal or total fields. You have to use the desktop version in order to be able to work with subtotals and totals. See Subtotal and total fields in a PivotTable.